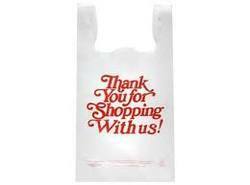 kindly contact us for the bag on roll , HDPE plastic bags , t shirts bags. Devish Exim Pvt. Ltd. is a Ludhiana, Punjab based business organization, which came into existence in the year 2000. We are amongst the renowned manufacturer, importer and exporter of extensive range of Sandos / A-Shirts, Mens V-Neck T Shirts, Mens Round Neck T Shirts and Thermal Wears made of 100% Cotton Knitted Fabric. Our product range is highly demanded and admired by millions of clients based across world for their premium quality standards and exceptional features like shrink resistance, neat stitching, color fastness, skin friendliness and many more. We use modern production techniques and finest quality materials in our manufacturing process to deliver a range of world-class products in the market. Our production process is carried out as per the prescribed industrial standards. The company practices stringent quality control management system in its business operations, in order to ensure maximum benefits of the clients. In order to render complete satisfaction to our clients, we also offer customized products as per the specific demands and requirements of the client. One range can avail these products at competitive prices and with a time bound delivery assurance. We are looking for foreign queries only.